A: I love the cute on-screen keyboard on my tablet. Plus, it has a hundred books in the book application! B: That's a picture of a keyboard! 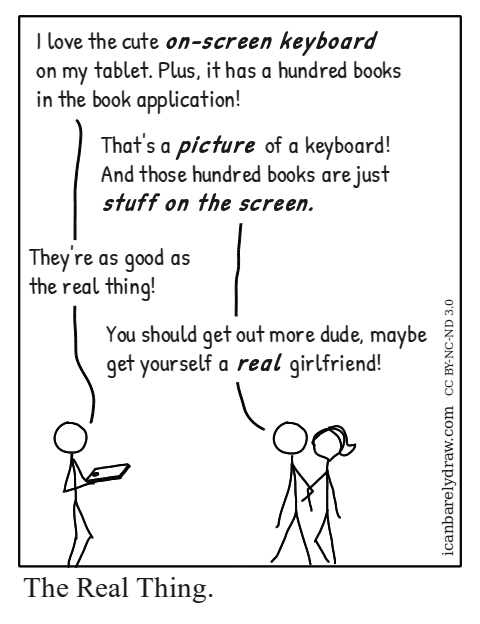 And those hundred books are just stuff on the screen. A: They're as good as the real thing! B: You should get out more dude, maybe get yourself a real girlfriend! But to be honest, could you tell the difference between a real girl and a girl in the Matrix?